That is such a great picture. Hopefully this is a sign of Harper finally "breaking out" so to speak, and not just a blip of his potential that would be overshadowed by subpar play over the next two months. I was trying to get the url for it a espn to post it here but they appear to disable the right click on their images. Span is a class act - never an indication that he was ticked at Harper for the comments 3 weeks ago. You could make the argument that she had the best female rock singing voice of all time. Didn't care much for Rondstadt, because all she ever sang were established hits, and never as good as the original. Roy Orbison was a far more talented singer and she should never have tried to sing Blue Bayou. I did like the one song she had with the Ponies - "Different Drum" or something like that. What a tear! 1.000 hitter over his last two times up, 2 for his last 5 (.400) for those who want a bigger sample size! I was so excited to see Bryce's homer but even more excited to see the way he was with Denard after the homer. Does not appear to be any tension between them. Always wanted to hear her Blue Bayou after someone strikes out on a fastball. He's at 107 AB's now. Good to go. 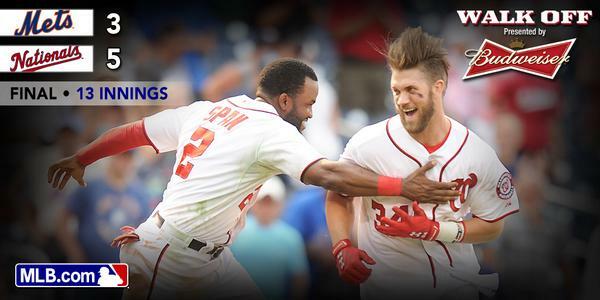 Who is Harper's best friend on the Nats? I know he and Roark, Werth are pretty tight. How does he and Rendon get along? You're his bff, you tell us. He needs to know this so he can write accurate slashfics. You know so much more about him than we do... so much. You know Bill Ladson's his main homeskillet. And he's back to playing like pure crap. freak this bust. He should have done it in a chair like Jennifer Beals. Looks crazy windy up there today. This water bucket challenge is freaking stupid.